A police car is never a welcome sight to someone who has imbibed enough to risk an arrest for DUI in Los Angeles. But in Glendale, California, the police department is hoping that all motorists will think about the hazards of DUI when they see its new department vehicle coming down the street. The front of the sedan features a black and white paint job—a traditional cop car look. The rear, however, looks like a yellow taxi. 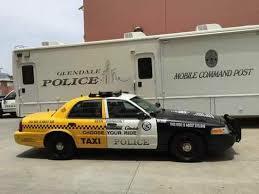 A press release from the City of Glendale Police Department said the goal of the unique vehicle is to increase public awareness, to create discussion about the dangers of impaired driving and to remind motorists that they need to make responsible decisions when drinking. The police will use the vehicle for educational purposes and not for DUI enforcement. In the last two years, the City of Glendale has seen 1,049 DUI arrests, 212 DUI-related traffic collisions and 52 DUI-related injuries. The hood of the police/taxi car features a breakdown of the estimated costs of a DUI misdemeanor in California, as outlined in Vehicle Code 23152 (a). They total more than $15,600, including a $390 fine; $1,245 in penalties; and more than $10,000 in increased auto insurance premiums.